Living in Egypt apparently isn’t as safe as it used to be. On the bustling streets of Cairo, vendors are setting up shop on street corners, selling everything from fruit to electronics. But one new trend has surfaced that reflects the growing crime rate and sense of insecurity among its citizens; the popularity of stun guns. 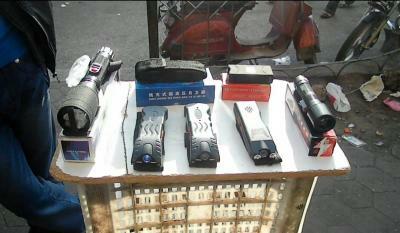 Many street vendors are setting up shop selling Chinese made stun guns for self protection. They retail for about 100 to 200 Egyptian pounds (about 20 – 30 dollars), which makes them affordable to average Egyptians. Although the government is trying hard to convince foreigners that the country is safe, it hasn’t yet convinced it’s own citizens. Since the fall of Mubarak, sales of stun guns have skyrocketed as citizens look to take responsibility for their own self defense. There seems to be a rising sentiment among the Egyptian people that the rise in crime and ensuing insecurity is intentional, that the government fosters this insecurity to manipulate the populace to crave a strong response. Thus, opening the door for a strong military ruler to take over. Whatever the cause, it’s clear that Egyptians have decided to provide for their own personal protection” instead of relying on the police. They have embraced the use of self defense products as a solution to the crime problem as well as showing their capitalistic side. Whatever the eventual outcome, you have to admire their resolve and rugged individualism.